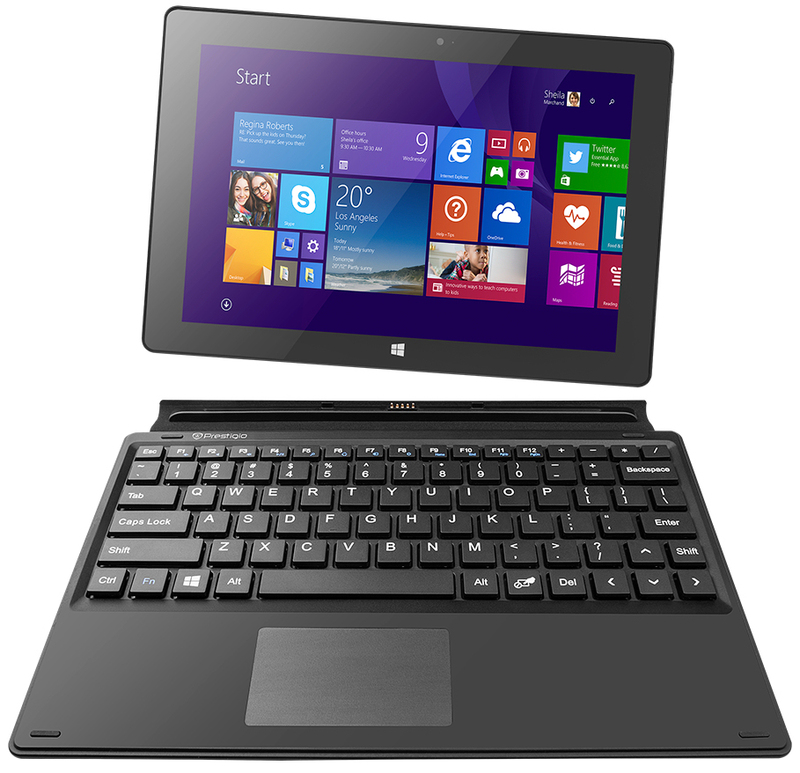 The Prestigio Multipad Visconte 3 3G is another inexpensive 10.1-inch Windows tablet in our editorial office. Contrary to many other Windows tablets that we review, it is possible to use the Internet on the road with the Multipad – thanks to the integrated 3G modem. Our review shows if the tablet can convince with other features besides the modem. Rivals for the tablet are the Trekstor SurfTab Wintron 10.1, Odys Winpad V10, HP Pavilion 10-k000ng x2 and Captiva PAD 10.1 Windows, for example. The two-colored back of the tablet is an immediate eye-catcher: Two thirds of the back are made of a matte silver plastic, while the other third is made of black plastic that was decorated with a pattern. The rest of the chassis is made of black plastic as well. The build quality of the tablet is decent, only the torsion resistance could be a bit higher for our taste. Basically all tablets that you can buy nowadays have at least one Micro-USB port, and the Multipad is no exception. However, you will also get a second "standard" USB port, which means it is very easy to attach USB devices. Both the MicroSD slot as well as the SIM card slot (Micro-SIM) are hidden behind a cover at the top of the tablet. There is also a Micro-HDMI port, so you could use the tablet as a silent player for your TV, for example. At the back of the tablet is a 5 MP camera; at the front is a webcam with a 2 MP sensor. Similar to almost all inexpensive Windows tablets, the Multipad uses the 32-bit version of Windows 8.1 with Bing as operating system. This version does not need as many resources as the 64-bit version. Buyers of the tablet also get a one-year license for MS Office 365 Personal. The MicroSD slot and the SIM card slot are hidden beding a cover. Prestigio also sent us the optional keyboard dock, which is available for around 50 Euros. It is also a protective cover and a stand at the same time. The main keys of the non-illuminated chiclet keyboard are not too generously sized with around 12 x 12 millimeters. People with big hands will not be very satisfied with the input. The keys have an average pressure point, but the keyboard bounces during typing because it does not lie flat on the underground. The dimensions of the touchpad are roughly 6.8 x 4.2 centimeters and the slightly roughened surface is no problem for the gliding capabilities. You get a touchpad and not a ClickPad, but Prestige did not integrate separate mouse buttons, which means you cannot use the function of the right mouse button. The touchscreen works without problems and executes inputs very quickly. It supports up to ten inputs simultaneously. The 10.1-inch display of the Multipad has a native resolution of 1280x800 pixels. Brightness (298 cd/m²) and contrast (774:1) are pretty good and do not cause any criticism. A higher luminance would be nice though since tablets are often used outdoors and have to fight against the sunlight. Still, you cannot really expect a better performance when you consider the price. The color presentation of the display is okay. We were able to measure an average DeltaE 2000 deviation of 5.21 ex-works; the target value would be smaller 3. We can also notice a slight blue cast. The integrated panel is based on the IPS technology, which means the display content is visible from every position. The glossy surface of the screen makes it very tricky to use the tablet outdoors. A really comfortable use of the device is only possible in the shade. The Multipad provides sufficient performance for applications from the categories office and Internet, and this also includes "standard" desktop applications. The integrated 3G modem also enables Internet connections on the road. Our review unit is available for around 250 Euros. 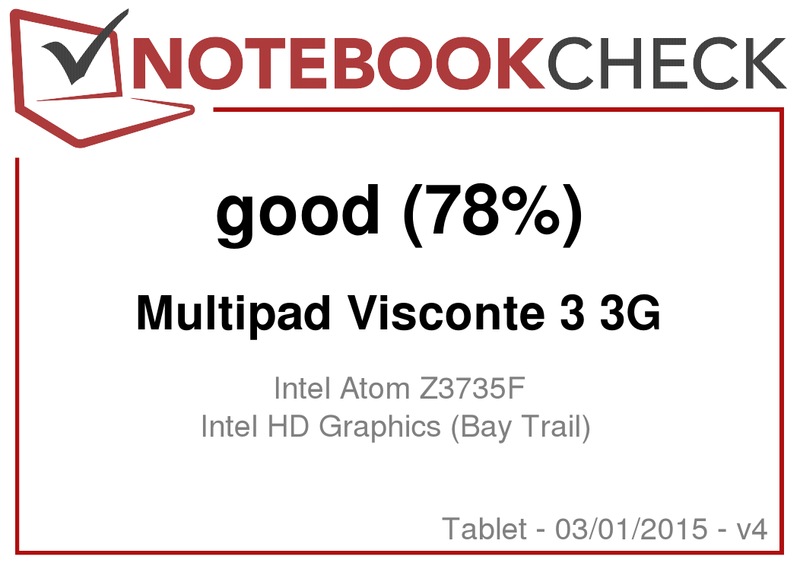 The Multipad is powered by an Intel Atom Z3735F (Bay Trail) quad-core processor with a very low TDP (<4 Watts), which means it can be cooled passively. The CPU runs with a nominal clock of 1.33 GHz, but can reach up to 1.83 GHz via Turbo Boost. We can see that the Turbo Boost potential is utilized on mains as well as battery power: The CPU tests of the Cinebench benchmarks are executed with 1.58 GHz up to 1.83 GHz (single-thread) and 1.58 GHz (multi-thread), respectively. The tablet runs very smoothly and without hiccups. The results in the PCMark benchmarks are on par with similarly equipped devices like the Odys Winpad V10 and the Trekstor SurfTab Wintron 10.1. The results of all three devices are at the lower end of our performance ranking. Similar to the majority of tablets, the Multipad is equipped with an eMMC storage module. In this case you get a total capacity of 32 GB and the user can use around 21 GB for files and applications. The transfer rates of the storage module are on the expected level for eMMC storage. It is possible to expand the storage via MicroSD card. Buyers of the tablet also get 1 TB storage for Microsoft's cloud service "OneDrive" for free (limited to 1 year). Intel's HD Graphics GPU handles all the graphics calculations of the tablet. It supports DirectX 11 and runs with up to 646 MHz. The results in the 3DMark benchmarks are not really surprising and are once again similar to the competition. The results show that the GPU is at the lower end of the performance ranking. The tablet was not designed for complex video games like Far Cry 4; the integrated hardware is just not powerful enough. You should focus on titles from the Windows Store if you want to play games. Those titles are usually running on the tablet without any problems. Our stress test (Prime95 and FurMark simultaneously for at least one hour) shows the same behavior of the tablet on mains as well as battery power: The processor runs with 1.58 GHz for around 30 minutes before it is throttled to 1.33 GHz for short periods. This fluctuation continues over the course of the test. 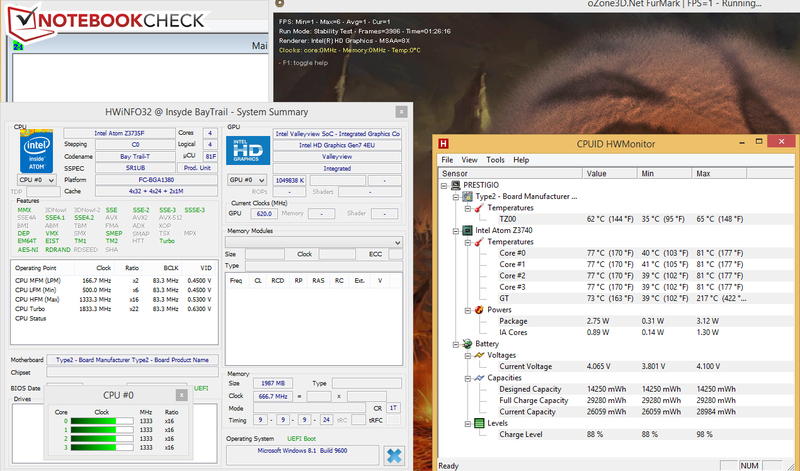 The GPU on the other hand can maintain 620 MHz and the clock is just sometimes reduced to 520 MHz after one hour. You can actually feel that the CPU and GPU clocks are just slightly reduced: One measuring point surpasses 50 °C during the stress test. Still, this scenario is not likely in practice where you will never fully stress the CPU and GPU at the same time. The stereo speakers of the tablet are located at the back and the sound quality is actually quite nice. They produce a rich sound that is not annoying after longer periods. We already reviewed tablets with worse speakers. The power consumption of the tablet in all scenarios is similar to comparable tablets. We can measure a very low idle consumption of up to 1.1 Watts. The values are obviously higher when you charge the battery at the same time. Our realistic WLAN test opens new websites every 40 seconds via script while the "Balanced" power profile is active (only this profile is available) and the display brightness is adjusted to around 150 cd/m². The Multipad manages a runtime of 6:01 hours. 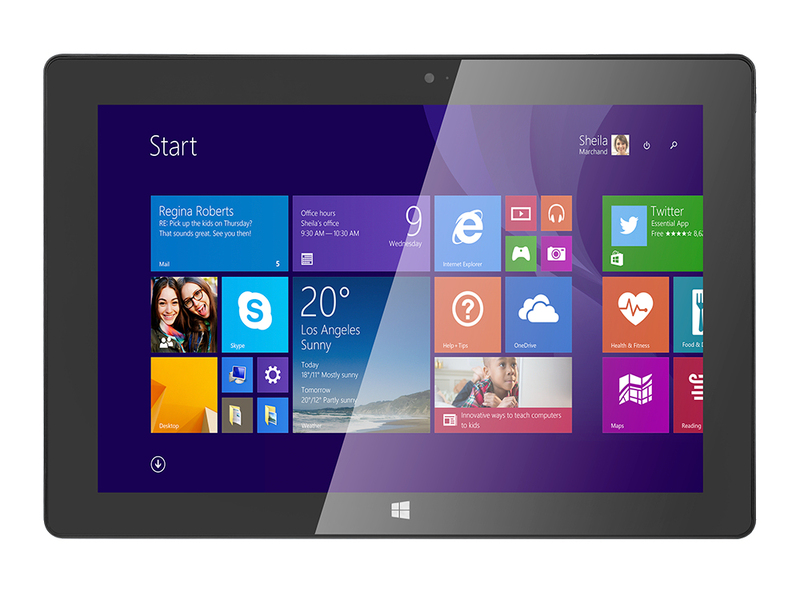 The Prestigio Multipad Visconte 3 is a simple Windows tablet with a 10.1-inch screen. It is not only possible to use apps from the Windows Store with this tablet, but also "normal" desktop applications. Despite the low price you do not have to live without a bright and high-contrast IPS display. In addition you also get good battery runtimes. Attaching USB devices is possible without an adaptor since there is a standard USB port besides the Micro-USB port. The highlight of the tablet is the integrated 3G modem, which means you can access the Internet on the road. A SIM card or a mobile plan, respectively, are not included. The package is rounded off with a one-year license for MS Office 365 Personal. 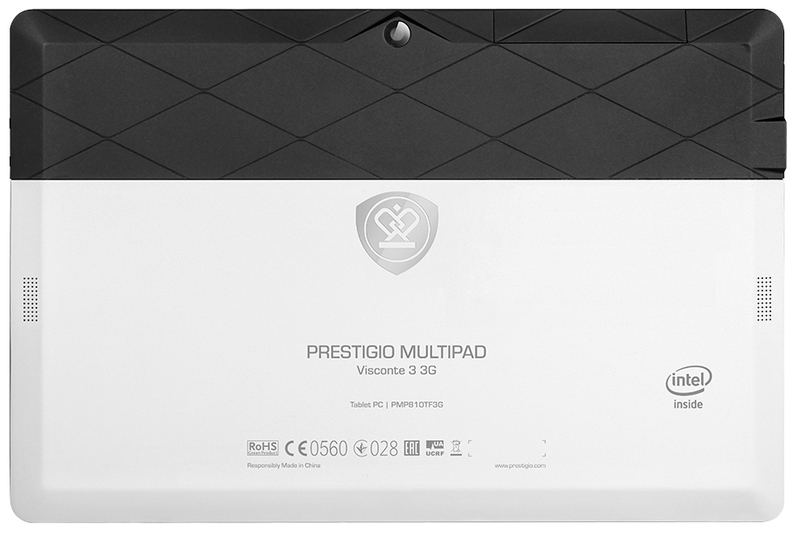 We also want to mention that Prestigio grants a two-year warranty. Many rivals only have a warranty period of 12 months. 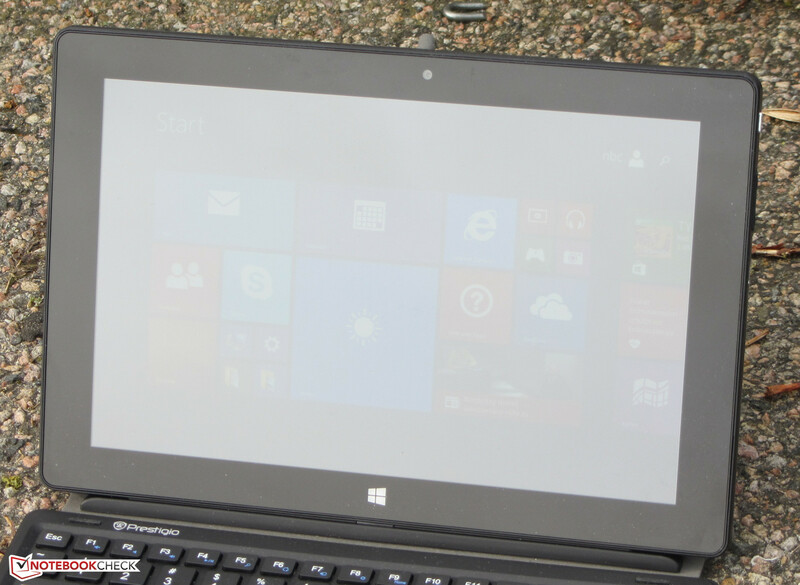 In Review: Prestigio Multipad Visconte 3 3G. Test model courtesy of Prestigio.